The final step in factor analysis involves the determination of model fit. A basic assumption underlying factor analysis is that the observed correlation between variables can be attributed to common factors. Hence, the correlations between the variables can be deduced or reproduced from the estimated correlations between the variables and the factors, The differences between the observed correlations (as given in the input correlation matrix) and the reproduced correlations (as estimated from the factor matrix) can be examined to determine model fit. These differences are called residuals, If there are many large residuals, the factor model does not provide a good fit to the data and the model should be reconsidered. In the upper right triangle of the “Reproduced Correlation Matrix” of Table 19.3, we see that only five residuals are larger than 0.05, indicating an acceptable model fit. Visit: www.nokia.com and search the Internetusinga searchengineas well as your library’s onlinedatabase toobtain informationon consumers’ preferences forcellular handsets. Nokia would like to determine the factors that underlie the cellular handset preferences of 15- to 24-year-olds, the heavy users of cellular handsets, What data would you collect and how would you analyze that data? As the marketing manager for Nokia, what strategies would you formulate to target the 15- to 24-year-olds, the heavy users of cellular handsets. The objective of this study was to develop a rather comprehensive inventory of manufacturer-controlled trade promotion variables and to demonstrate that an association exists between these variables and the retailer’s promotion support decision. Retailer or trade support was defined operationally as the trade buyer’s attitude toward the promotion. 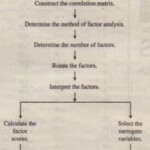 Factor analysis was performed on the explanatory variables with the primary goal of data reduction. The principal components method, using varimax rotation, reduced the 30 explanatory variables to eight factors having eigenvalues greater than 1.0.For the purpose of interpretation, each factor was composed of vanables that loaded 0.40 or higher on that factor. In two instances, where variables loaded 0.40 or above on two factors, each variable was assigned to the factor where ithad the highest loading. Only one variable, “ease of handling/stocking at retail,” did not load at least 0.40 on any factor. In all, the eight factors explained 62 percent of the total variance. 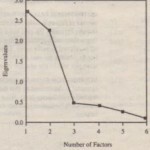 Interpretation of the factor loading matrix was straightforward. Table I lists the factors in the order in which they were extracted. Stepwise discriminant analysis was conducted to determine which, if any, of the eight factors predicted trade support to a statistically significant degree. 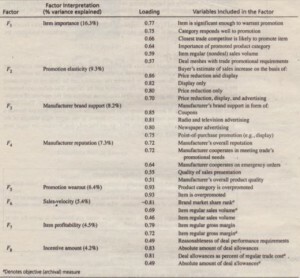 The factor scores for the eight factors were the explanatory variables. The dependent variable consisted of the retail buyer’s overall rating of the deal (Rating), which was collapsed into a three-group (low, medium, and high) measure of trade support. The results of the discriminant analyses are shown in Table 2. All eight entered the discriminant functions. Goodness-of-fit measures indicated that, as a group, the eight factors discriminated between high, medium. and low levels of trade support. Multivariate F ratios, indicating the degree of discrimination between each pair of groups, were significant at p < 0.001. Correct classification into high. medium, andlowcategories wasachieved for 65 percentof thecases. 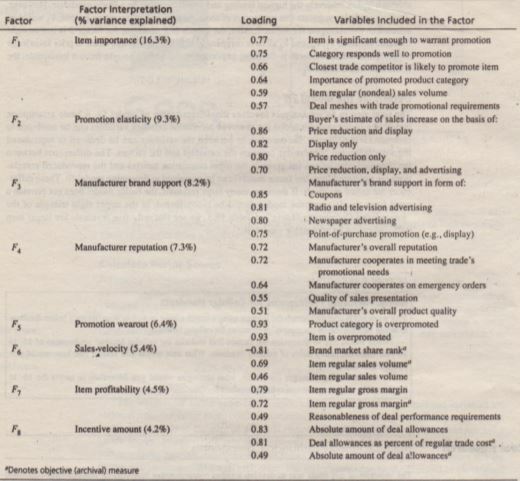 Theorderof entry into discriminant analysis was used to determine the relative importance of factors as trade support influencers. In keeping with the results of this study, P&G decided to emphasize items importance, item profitability incentive amount, and its reputation in order to gamer retailers’ promotion support. Partially as a resultof theseefforts,P&G bands touched the livesof peoplearoundtheworld three billion times a day in2009. 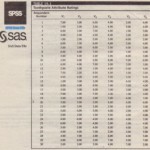 The data of Table 19.1 were analyzed using the common factor analysis model. Instead of using unities in the diagonal, the communalities were inserted. The output, shown in Table 19.4, is similar to the output from principal components analysis presented in Table 19.3. Under “Communalities” under the “Initial” column, the communalities for the variables are no longer 1.0. Based on the eigenvalue criterion, again two factors are extracted. The variances, after extracting the factors, are different from the initial eigenvalues. The first factor accounts for 42.84 percent of the variance, whereas the second accounts for 31.13 percent, ineach case a little less than what was observed in principal components analysis. The values in the unrotated “Factor Matrix” of Table 19.4are a little different from those in Table 19.3, although the pattern of the coefficients is similar. Sometimes, however, the pattern of loadings for common factor analysis is different from that for principal components analysis, with , some variables loading on different factors. The rotated factor matrix has the same pattern as that inTable 19.3, leading to a similar interpretation of the factors. Another application is provided in’ the context of “common” rebate perceptions.